Endodontist versus My Dentist: Which One? As dentistry becomes more advanced in terms of technologies, the limits of the potential for change (improvement) in functional and/or cosmetic outcomes increases correspondingly. As simple example of this would be the impact that Cone Beam Catscans have had in the area of diagnostics and implications for treatment. Reconstructive opportunities with this technology provide patients with treatment options and possibilities that didn't exist just a few years ago. All treatments in medicine and dentistry have rates of predictability. As treatment opportunities increase, so do the opportunities for treatment failures. The failed treatments can have different causes; technical errors and failures due to tissue conditions or overall difficulty of treatment. Root canals, for some patients, seem to be recommended too often. Crown replacements, amalgam replacements, large fillings, complex bridgework, occlusal conundrums .... even basic dentistry at times, can ultimately involve a root canal recommendation. The procedure is usually recommended when infection or inflammation is present... or can be recommended when pain issues with a particular tooth are not resolvable through other means. Endodontic Specialist or General Dentist? 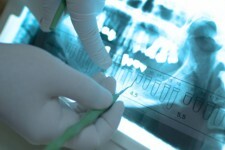 Endodontic Specialists (Endodontists) have advanced training that goes beyond the DDS or DMD degree. As practitioners they invest in microsopy - surgical equipment and technologies that are usually "cutting edge" and go significantly beyond what any "regular" dentist would have access to. General Dentists (generally speaking), receive training for RCT's (root canal therapy) and are an excellent resource for what might be called routine treatment (uncomplicated). Tooth root configurations are different however for some teeth. Root treatment needs that are deemed complex are usually referred to an Endodontist. Unfortunately, in some cases, the realization that a root system and treatment need is unusually complex isn't discovered until surgery is underway. It is not uncommon for an Endodontist to have a different clinical "picture," compared to a patient's referring dentist. These differences should be welcomed in most instances... due mainly to the access to the advanced instrumentation of a specialist.